Why should you choose us to help you sell your home? We are passionate about helping you accomplish your goals! We have been able to help people sell their homes when other methods have failed, and have been able to sell homes for more than other agents said they could! We will work relentlessly to market your home, and will get you the best possible price, in the shortest amount of time on the market, with minimal inconvenience to you. To schedule a personal evaluation of your home, please fill out the info below, and we will be in touch! We are not agents who will list your home, stick a sign in the yard, and sit back and hope for the best! We will be actively marketing your home through a variety of online and social media platforms. The proprietary methods we use have enabled us to secure the buyer in half of our listings over the past year. We use very targeted marketing campaigns to make sure your home is being seen by people most likely to be interested in purchasing a home like yours in your area. When we do secure the buyer for a listing we represent, we reduce the total commission we charge, which can save you thousands! We’ll have your home professionally photographed, at no cost to you! Pictures are the most important part of marketing a home. This is a potential buyer’s first impression of your home, and the quality of the pictures can be the difference between the buyer scheduling a showing for your home or not. Some other agents’ pictures are just horrible. You can't really see the room, the lighting is off, and some even use their cell phones! Our photographers have the sophisticated equipment to create a top notch wide angel picture of each room, with perfect lighting and exposure, so the buyer can appreciate the room and see how the room flows, and not have to squint and look sideways to try to comprehend what they are looking at. Rest assured, when you list your home for sale with us, your home will be very well presented through all aspects of marketing. 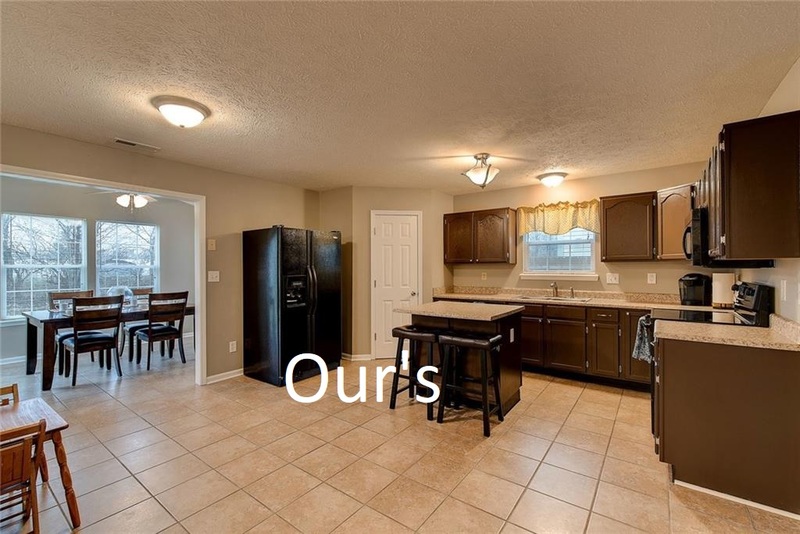 Here is an example of pictures of one of our listings, and one of our competitors. Which would you rather have? Enhanced and Exclusive Listings on the top 2 Real Estate search websites! Ever notice when you are looking for homes online, there are only a few homes that show up when you go to the search map, and you have to zoom all the way in to get to all of the homes available? That is because the homes that are showing up at first, are what’s called Enhanced Listings. Through Realtor.com and Zillow.com, the top 2 visited real estate search websites, your home will be an Enhanced Listing, which means it will show up higher in people’s search results, and show up more often. If someone is looking for a home like yours, in your area, they WILL be able to find your home easily if you list your home with us. Exclusive Listing contacts through Realtor.com and Zillow.com! Ever notice when you go to Zillow, that some homes have 3 real estate agents which show up next to the home for you to contact for more info? That is because these agents pay Zillow to be featured next to listings in that zip code. They do not represent the person selling that home. However, I bet if they are targeting that zip code, they have their own listings in that area, and if someone reaches out to them for more info, they will probably talk them into looking at their listing first. Realtor.com has advertising space, where they feature new home builders or other real estate agents in this space. On both Realtor.com and Zillow.com, I am the only agent showing up next to homes that I have listed. I don’t know about you, but if I were to list my home, I would rather my agent be in these spaces, than other agents. 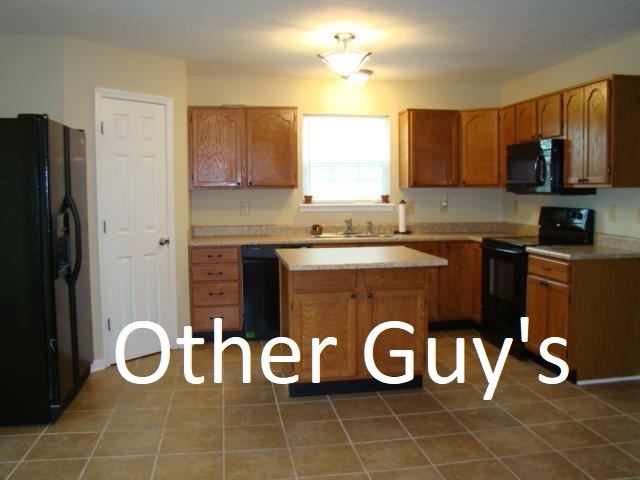 Here are 2 listings on Zillow.com. Which one would you rather have? We bring 18% more potential buyers than other agents! Ask most agents what credit score you need to buy a home, and they will tell you a 640, which is what their preferred lender will go down to. Our lender can get people approved to buy a home down to a 580 credit score, which will expose your home to 18% more potential buyers. These buyers are typically more motivated than most, and are eager to buy their first home! We give back to the communities we serve! We believe in giving back to the communities who have given so much to us! 10% of the income we earn on each listing sold is donated back to local schools through the DonorsChoose.org organization, where teachers request supplies for their classrooms. We have been able to fully fund many classroom projects all across the state of Indiana! To schedule a personal evaluation of your home, please fill out the info above, and we will be in touch! Avery contacted me through my for sale by owner listing and thought my house was underpriced. We agreed to meet, and decided to list with Avery. We listed it on Wednesday, and by Saturday he had 5 offers on the home in highest and best, and we accepted an offer for $10,000 more than we had it listed by owner. I would recommend Avery to anyone trying to selling a home! Avery was very easy to deal with. He was knowledgeable about pricing the home. The day the house went on the market, he released a video of the premises. Within 30 hours we had numerous offers for the house. We settled for $100 over asking price. Avery listed and sold my house within a couple weeks! He helped us find a new home in a very short amount of time since our home sold so quickly. He was very knowledgeable about the entire process! When thinking about what to write in a review of Avery, the first things that came to mind was how helpful Avery was and how he is an awesome realtor and person in general. Avery went above and beyond to help my family sell our home and buy a new home. Avery was always available when we had questions or concerns. When I first met Avery, I knew he meant it when he said he had our best interest at heart. Do yourself a favor, and contact Avery for any real estate needs. Avery will work to sell your home quickly, or help you find an awesome new house for a great price... or both! My husband and I had a very unique situation with selling our home. Most realtors I spoke with made me feel like they didn't have the time or interest in helping us get out of our situation. Avery never made us feel this way. He was very attentive, thorough and answered any questions or addressed any concerns we had. He is very professional and will do whatever he needs to do to help with your situation. He also helped us find our new home. He sold our old home and found us a new one very quickly. The thing I liked most about him is that he treated us like real people, not just like another client. I would like to believe that we met not only a very good realtor, but a new friend. I would highly recommend Avery Garrett to anyone I know selling or looking to buy a home. Our experience with Avery has been a very pleasant and productive one.